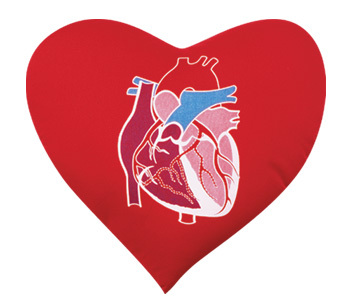 Standing up for the first time: slightly graphic: You may know that when someone has heart surgery, frequently the hospital will give them a heart shaped pillow to hold against the chest when coughing, sneezing, laughing, standing up, sitting down, etc. Mine is red and and has a colorful diagram of the heart. Heart pillow in hand on the morning after the surgery, I was told I would be standing up and taking a few steps. Don’t ask me why I was scared, but I was terrified. I gripped my pillow as the nurse and someone else helped me sit up. I felt really nauseous. After a few breaths and with assistance, I stood up. The nausea got 10 times worse and I told the nurse that I was going to throw up. She tried to assure me that I had not eaten anything in well over 24 hours and that this could not happen. I insisted I was going to throw up so she gave me a tray – you know, the spit tray they always have in hospital. And just as I was ready to throw up, out came a very loud burp. The nausea passed. Next, she wanted me to let go of my pillow so that I could sit down. The poor nurse practically had to peel my fingers from the pillow. I held onto it as if letting go would lead to a 30 foot plummet. We did manage to release first one hand and then the other. Don’t be a hero: On the morning after my surgery, I was visited by two or three doctors. At least one of them works with my surgeon. She told me how well things went, how good I looked, and reminded me to take pain medication as needed. Her order – “Don’t be a hero.” Given that I seem to struggle with that whole idea of taking narcotics when in pain, she repeated the same order for the next two days. I did finally listen, sort of. First shower and flood: Once all of the tubes, wires, and IVs (except for one) were removed, I was able to take my first shower. My boyfriend took off his shoes, rolled up his jeans and helped me shower. Actually, he showered me and I sat shivering. When we finished, we found that not only was the entire bathroom flooded, but there was water running into my room. Of course this meant that my boyfriend spent the next several minutes mopping up the bathroom and hospital room until housekeeping arrived. Evidently this is a design flaw. My surgeon came to visit on a Sunday morning: The morning of the day before my discharge, my surgeon came to visit. It was Sunday and he did not appear to be working that day. However, he took time to come in and talk to me, answer my questions, diagram my surgery on my heart pillow, and even autograph it “Vincent” (his first name). This was so remarkable to me. He sat directly across from me and spoke only to me. He stayed until every question had been fully answered and was gracious and thoughtful. When I knew it was time to go home: On the night before my discharge, I knew it was time to go. One nurse had noted that I had a history of abdominoplasty and wanted to talk about my experiences with the surgery. Later that night (around 2am), I had a discussion with an overweight nurse about my bodybugg, hydration, and nutrition for weight loss. In both cases I was doing the coaching. When I find myself in that role, I know it is time to go. There are other brief moments: the nurses on the stroke unit applauding me for taking such a long walk 2 or 3 days post surgery; hearing someone receive last rites and then noticing the room was empty the next time I walked that day; my relative youth compared to everyone else on my unit; and the number of times people told me my color was so good post surgery. All in all, everyone took very good care of me and their love for their work was obvious. Hello! I hope we stay in touch. I am very scared to be operated. Cheers, Erik.